Are you familiar with Dropbox, Sugarsync, Pogoplug and other cloud storage offerings? If not, then let me introduce you to cloud storage party. Cloud storage solutions are everywhere these days. It ranges from FREE to a few dollars a month subscription. Dropbox gives you around 2 GB for free and if you want more, you need to shell out a few dollars more. Microsoft’s Live Drive gives you 10 gb and Google Drive 5 gb respectively. I, however, haven’t seen anything generous as 50 G. That’s why I am really impressed with the generosity of Kim Dotcom for giving away that much space for free when he introduced MEGA. If you say yes or agree to all these questions from www.adobochannel.com, then you probably need Mega. I am sure most of you are familiar with cloud storage. If not, cloud storage is a like a hard drive in the sky that you can access anywhere you are (with Internet connection of course). “Cloud Storage” does not really mean that your files will be stored in the heavens. It is just a monicker slapped into anything that stores digital files remotely using the internet. Using your thumb drive, CDs and floppy disk to transfer and save your digital assets is a bygone technology. Cloud storage like Mega works in similar fashion as the aforementioned tools with a humongous advantage of not physically carrying it with you. You can use it to backup, transfer and access digital files whenever you need it. The only drawback is you need internet connection to access it. Without online connectivity, it is as useless as a winter coat in the summer time. As I have mentioned above, Mega is like an online file locker. You upload your files through their browser-based client and download the same when you need it. My friend, I have to be honest with you. There is no fool-proof guarantee of security online. Once you put it out there, the risk of breaches is high. Just make sure you don’t upload sensitive information on it to prevent those possible mishaps. So if you think you need this tool and its functionality, why not try MEGA. It is free ,so there’s nothing to lose but everything to gain if you try it. 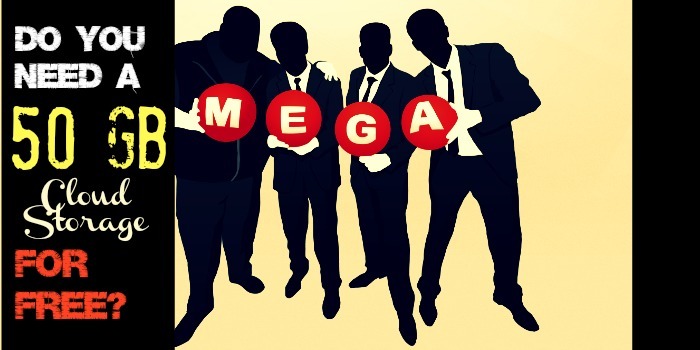 Mega is the new cloud-based venture from Dotcom, who saw his notable file-sharing site Megaupload shut down in January 2012 by the FBI on alleged copyright and racketeering charges. Dotcom insists the new site is legal thanks to stricter encryptions that will make its files harder to access. Mega gives yu a whopping 50 gb of space which is bigger than what Google and Microsoft can give. Aside from Mediafire, which is another file-sharing site, Mega has the biggest space you can get for the price of FREE. ← Want a Free PDF Creator?